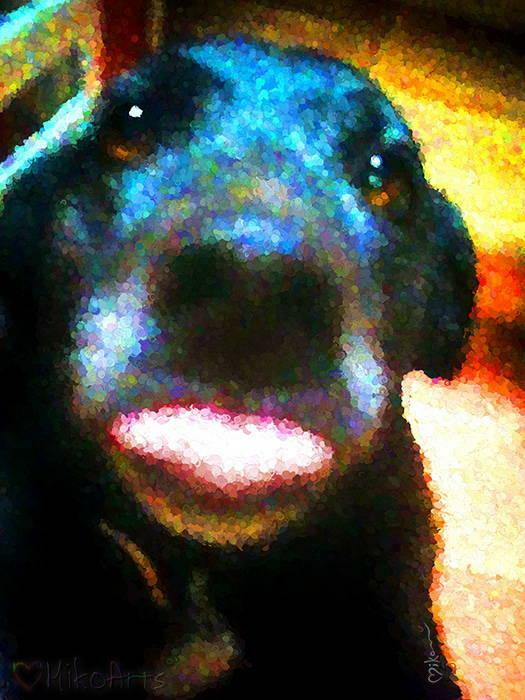 A Black Lab Pouts: Miko Zen's Painting, Boo!! No Bacon!! Poppy the Rescue Black-Lab Mix, very dismayed at the fact that upon entering our humble South Valley kitchen having been just awoken by the sounds of clinking pots and pans and electric clicking of stovetops and tearing plastic wrappers, would find no bacon! 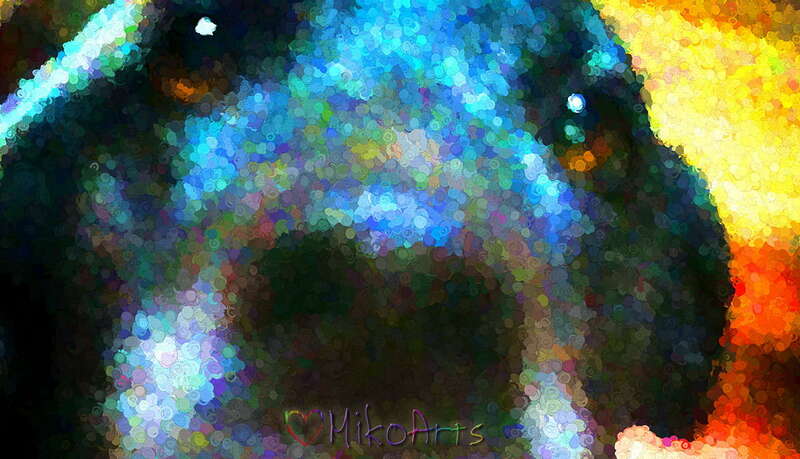 Our Black Lab Digital Painting.. Boo!! No Bacon!! For all her mighty effort to come inspect the goods and purvey what morsels I would happily put on plates for her, that, amongst it all, there was still, no bacon. Poppy is a loveable Black Labrador Mix, but really she's a love-mutt at with a big fat rotten-catfish-yearning Texas heart. And she's got that particular Southern-offshoot of hospitality that is so impeccably genteel that sticking out her tongue is most definitely deserved. She was raised on the small town streets of a Panhandle town and rescued while still a pup, and has since learned the ways of the kitchen and all its expectable bounties. But tonight, coming back from the grocery store, she's just discovered that amidst the cheeses and pastas and rice and peppers and garlic and spinach and tortillas and spices and sauces and maybe a fresh fish or two, there is no bacon anywhere to be had. Tonight she will just have to make do with a three egg goat cheese omelette cut in half, part for her and part for Max our twelve clawed cat. (Yes, Max really has that many toes!) And since I snapped a picture of Poppy sticking out her tongue at me, I get to paint her just to remind myself what never ever to forget to get her at the store next time.